The early childhood program at Greene Hill provides young children with opportunities to engage creatively with each other, and with a variety of materials. Children in the 4s class make choices about how to spend their time throughout the day, using materials like blocks, paint, puzzles, and games. They gather for shared experiences like read-alouds, songs, and short daily classes like Spanish, music, visual arts, or movement. Their days are structured and consistent, with outdoor play time in the morning and a rest after lunch. Direct instruction in reading, writing, and math begins in the 5s, within the context of a day still filled with play and exploration. Class-wide studies for the 5s and 6s allow children to learn more about the social and natural world through community investigations. 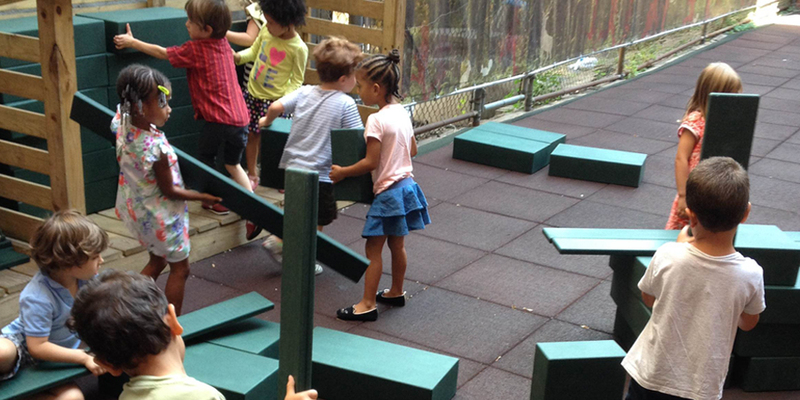 Work in the block area is crucial to these age groups, as children interpret structures and systems they’ve seen in their community. In the upper grade classrooms, students begin to consider more distant places and times, and more abstract scientific concepts. Their social studies work brings students in contact with the diversity of human experience, gaining a global perspective and contending with issues of social justice. Classes visit the Science Lab for twice-weekly sessions with a science teacher, and begin trimester-long technology courses. Homework begins, with nightly reading Logs for 7s, and two assignments a week beginning in the 8s and increasing in frequency through the 10s. Students have daily opportunities for self-initiated work during Open Work, sometimes in connection with shared curricular studies but also in pursuit of outside interests and skills.